For articles that show how math can be used in the photography/printing/framing businesses. I have some ideas for shooting the eclipse by either phone or SLR camera. For those who haven’t heard, the next eclipse will be Monday, August 21st. In Miami, the eclipse will start around 1:30 pm, which is right after local apparent noon (when the sun crosses due south of us around 1:24 pm and is 77° above the horizon). The eclipse will last about three hours, by which time it will have reached an azimuth (compass bearing) of 261° and dropped to a height of 44°. At its peak just before 3 o’clock, it will be 64° above the horizon at a bearing of 243° (west-southwest). At that time, less than 1/5 of its diameter will be visible in South Florida, which means that about 22% of the sun’s area will still be showing, and the sun will still be a little less than 1/4 of its normal brightness (for lack of anything better at hand, I used Photoshop’s Count Tool to figure the sun’s brightnessHow). The resolution for the selfie camera may not be as great as on the regular camera. (I explain why bigger is better on the Bee Happy Graphics FAQ page). My selfie camera doesn’t have controls for flash, exposure, white balance, and other things; these features being listed in the order of their importance. You will need fill flash on your foreground subject, and the flash will probably need to be less than two feet away to be effective. But that means the camera is in regular (non-selfie) mode and both aiming and pushing the shutter button could be a pain. A short timer, if your app has one, could be helpful in pushing the button. First, you will need neutral density filters, not just for the proper exposure but unless you shoot in Live View mode it is more important that the filters can adequately protect you looking through the viewfinder. For that, a 10-stop filter is not enough (but a 12-stop filter, if it existed, could be (at your leisure, you can check out the Bee Happy Graphics blog for another reason a 12-stop neutral-density filter would be better than a 10-stop). A 15 or 16-stop filter would be even better in this case. Focus on the horizon before attaching your filters and lock in your focus. If using a zoom lens, begin as wide as possible; it is easier to find the sun before zooming and avoid the dangers of trying to peek around the camera. You will need exactly the same focal length or amount of zoom that you needed when you took pictures of the moon. Most experts feel anything less than a 300mm lens is a waste of time. Remember that your shutter speed should be 1/(focal length x crop factor) or faster if you not using a tripod, but even with a tripod there may be no reason to go with less. The aperture (f-stop) setting is not critical since all the action is at infinity but should be small enough (large enough number) so that you can keep the ISO at its lowest value. If you are planning to capture the whole eclipse in a sequential composite photograph, decide how many images you need, subtract one, and divide that number into 180 minutes (the duration of the eclipse). If you want a string of six suns in your picture, each picture will be 180/5 or 36 minutes apart. The camera will probably not be locked down to the tripod for the duration, but the focal length of the lens and other settings should be the same for the entire series. The only way to get something in the foreground (for better composition), is to go for multiple exposures and combine them manually. At the designated time, take the sun shot and while the camera is strapped to the tripod, record your camera settings, remove the filters, change the settings as needed and shoot the foreground. For multiple exposure shots, they usually advise changing only the shutter speed, but I’m not sure it matters in this instance. If changing the shutter speed alone is not enough, I’d change the f-stop before changing the ISO. Now record the settings of the foreground shot so you can repeat as necessary. If you must change the focus for the foreground shot, be sure to refocus on the horizon before putting the filters back on. Return the camera settings to the sun shot values. You may now move the camera on the tripod to compose the next shot. I mentioned that the sun will be putting out only 1/4 of its normal light at the peak of the eclipse here in Miami. This means the exposure of your foreground shot will change by two f-stops. The exposure of your sun shots shouldn’t change. Since this is such a rare event, you may not want to put all of your eggs in one basket. This means changing the settings of your camera (bracketing, if you will, checking the histogram, and perhaps rechecking the focus), which may mean taking several sequences simultaneously and taking good notes. I’ve discussed some of your options, with some of the pros and cons of each one. While I try to cover the technical aspects, you are the artist and the compositional issues are all yours. It might be a good idea to get up early tomorrow and get some moon shots just for practice. The moon will be just a waning (shrinking) crescent. Moonrise here in Miami will be 4:37 am tomorrow and 5:40 Sunday (sunrise is 6:56 both days). Well, that’s about it. Have fun, don’t look directly at the sun, and let me know how it worked out for you. I’d even be willing to post some of your pictures (with adequate credits of course). We have a Logan Precision Sander Elite Model F200-2 disk sander for improving saw-cut miters for your picture frames to a “perfect 45°” after cutting the moulding to size on our miter saw. To maintain such perfection requires due diligence and occasional adjustment. How Do You Know When It’s Time To Adjust Your Sander? You may notice that when you put your frames together, there is a small gap between the pieces of moulding either on the inside of all four corners or the outside of all four corner. If some corners have gaps on the inside and some have a gap on the outside, you have other problems. The sander used on the miters of these two frames needs to be adjusted. Note gaps in corners. In the figures used in this article, the symptoms have been exaggerated for illustration purposes. If the condition of your sander gets this bad without you noticing, you may want to consider another profession or hobby. When you are comparing the lengths of opposite pieces, and you have them side by side with the miters face up and their back sides touching, you may notice by running your finger over the miter that they are the same length on one end of the miter but not the other, or that one piece of moulding is higher at one end of the miter and the other piece is higher at the other end. In either of these cases, it’s time to adjust your sander. But What About The Miter Saw? It may be true that the miter saw also needs adjustment, but that would have minimal impact on your frames, because even if the angle of the cut was wrong, the sander should correct that problem. Of course it would take more sanding to correct, which beside taking more time and effort could, in the worst case, result in your frame being too small, so it should periodically be checked and corrected according to the manufacturer’s instructions (I currently have no improvements or suggestions for that process). An indication that the miter saw needed adjustment would be if as you are sanding the miter, sawdust builds up on top of one side of the moulding faster than it accumulates on the other. If it takes too many revolutions of the sander to perfect the edge, that could also be a clue, or it could be time to change the sandpaper. On the last page of the 4-page manual (available at www.logangraphic.com) are simple instructions for that adjustment that should work well if you are willing to follow Step 1 and remove the sandpaper. Place the 45˚ square flat against the wheel and up against bar (Fig. 7). Look for gaps against the bar. Adjust the bar using adjustment wrench until gap disappears. Put miter cuts on both ends of two long scrap pieces of your widest moulding. When you sand a piece of moulding, each end will use a different side of the sander. Call one side of the sander “A” and the other “B”. As you sand the two pieces of moulding, mark the back of each end of each piece with the side of the sander used (A or B). Find a good right angle, either in a reliable carpenter’s square or using other methods. Flip one of the pieces of scrap moulding upside down so you can join Corner “A” on both pieces to make a 90˚ (right) angle. Flipping is very important*. Put one piece of moulding along one edge of the reference angle (carpenter’s square) and slide the reference toward the second moulding until it just touches at one end or the other (if it touches at both ends, you are finished with Side A – skip ahead to Step 7). Measure the error gap (I like millimeters only because they are so small) at the end of the moulding that’s away from the reference line. Then measure the length of that piece of scrap moulding (using the same units of measurement). The adjustment screw on my sander had 32 threads per inch, and it was 109 millimeters from the pivot point. Based on that, your multiplier will be 25,000. I’ll do the math just in case your sander has different measurements so that you can substitute the real numbers in for mine at the proper places. One complete turn of the adjustment screw is 360° or 1/32” and there are 25.4 millimeters per inch, so the constant multiplier would be 109 mm * 360° per turn of screw * 32 threads per inch ÷ 25.4 mm per inch ÷ 2 errors = 24,718.11. We’ll say 25,000. Divide the error you measured in the last step by the length of the moulding that you measured and multiply by 25,000. Your result will be the number of degrees you need to turn the adjustment screw. If the error gap was at the corner, then the angle is too large and you have to turn the screw counterclockwise to back it out. 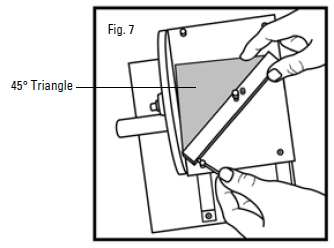 Conversely, if the error gap was at the end of the moulding, then the angle is too small and you have to turn the adjustment screw clockwise to push it out more. After making the adjustment, you may want to retest by repeating the process by starting at Step 2 and resanding the same two corners just used. Before sanding, I recommend drawing a line all the way across the end of the moulding with a pen or marker and then sanding until the line completely disappears. Repeat this whole process (starting at Step 4) for the other two miters, labeled “B”. Remember, for these two you will be playing with the adjustment screw on the other side of the sander. That’s all there is to it. Congratulations. Math Warning: a quick note about trigonometry (OPTIONAL)! This process was concerned with angles, not distances, but since angles are harder to measure with any precision we had to convert. When you take the ratio of the two perpendicular sides (the sides that are 90° apart) of a right triangle containing the angle you are interested in, that’s called the tangent of that angle, and you can have a good calculator app on your phone find it for you (for my Droid, I found RealCalc Plus by Quartic Software at the Play Store and was happy to pay $3.50. There are plenty of other options, though). The error angle you measured (indirectly) was actually twice as large as the real error. One problem is that the tangent curve is not generally a straight line, which means that the tangent of twice some angle is not the same as twice the tangent of that angle. That’s why the normal procedure would be to convert to angles, do the adding, subtracting, or multiplying, and then convert back to distances we can measure again. We were able to use the small angle exception, however. It turns out that for angles less than say 10°, the tangent curve IS pretty straight and the error introduced by taking our shortcut isn’t worth worrying about. That’s what we did, and that’s why the problem was so easy. That’s your math lesson of the day week month. Let’s get back to work.